This is the third part in a series of three articles describing how I created a basic DNS/DHCP/NTP server for my lab that only uses 24MB RAM and 12MB disk space. If you’ve followed parts 1 and 2 correctly, you should be able to hit the web-based GUI now. By default you can access this on any of the interfaces configured. Log in with the root account and the password you just set. 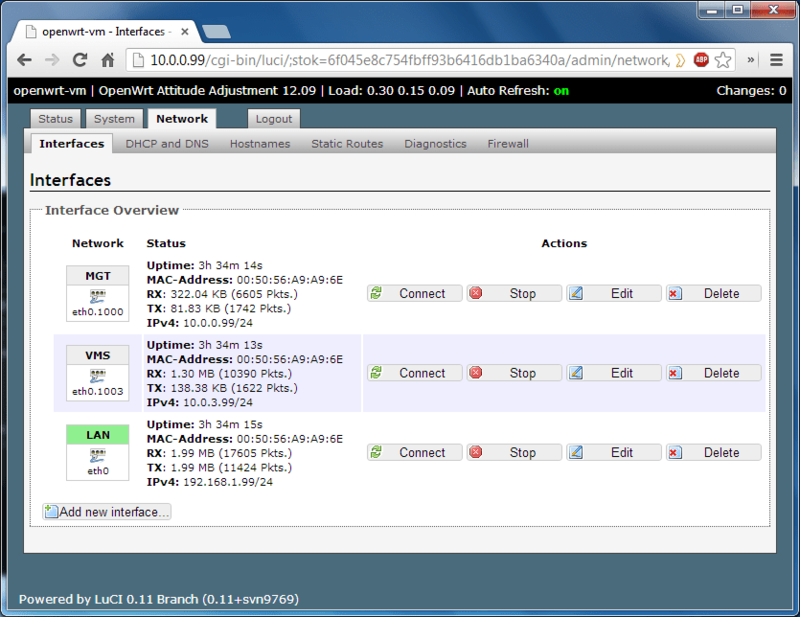 Clicking on the Network tab, followed by the Interface tab, shows the three interfaces that were manually configured in the /etc/config/network file. From here you can add new interfaces and edit existing ones. 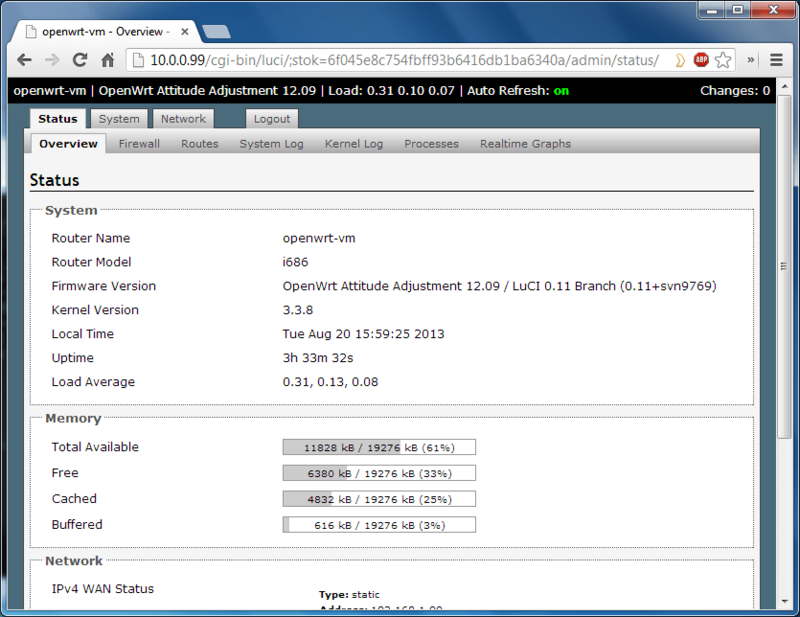 Configuring the OpenWRT instance to act as an NTP server is very straightforward. On the System > System tab, you can set the hostname and timezone. The Provide NTP server checkbox turns the OpenWRT VM into a local NTP server. 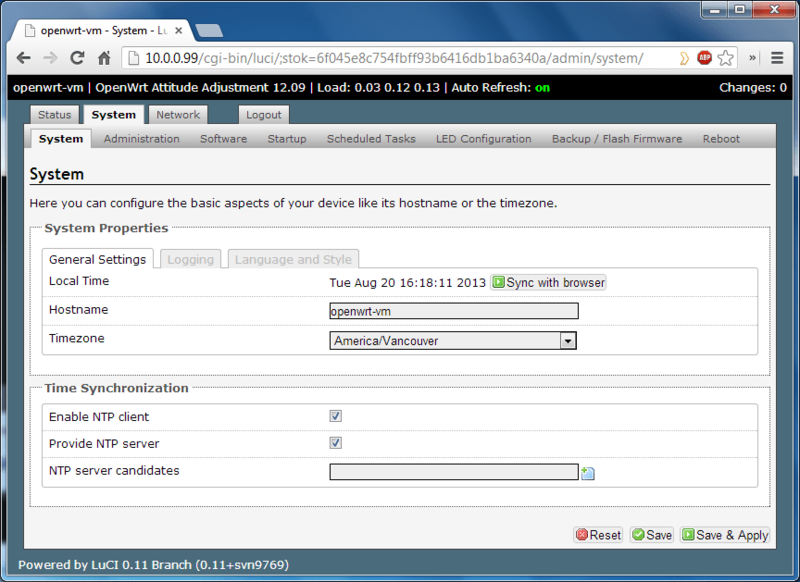 The Enable NTP client checkbox keeps it’s local time synced with external time servers. You can set pool servers here as well. My lab is completely isolated from the outside world so I don’t set pool servers. If the time is out, I use the Sync with browser option to update it, which will then correct all my downstream devices. In the real world having accurate time is important for things like log files, but in my lab the important thing is that all the devices have the same time – this NTP server does that. Once any changes have been made in the Web GUI, click Save & Apply in the bottom right corner. 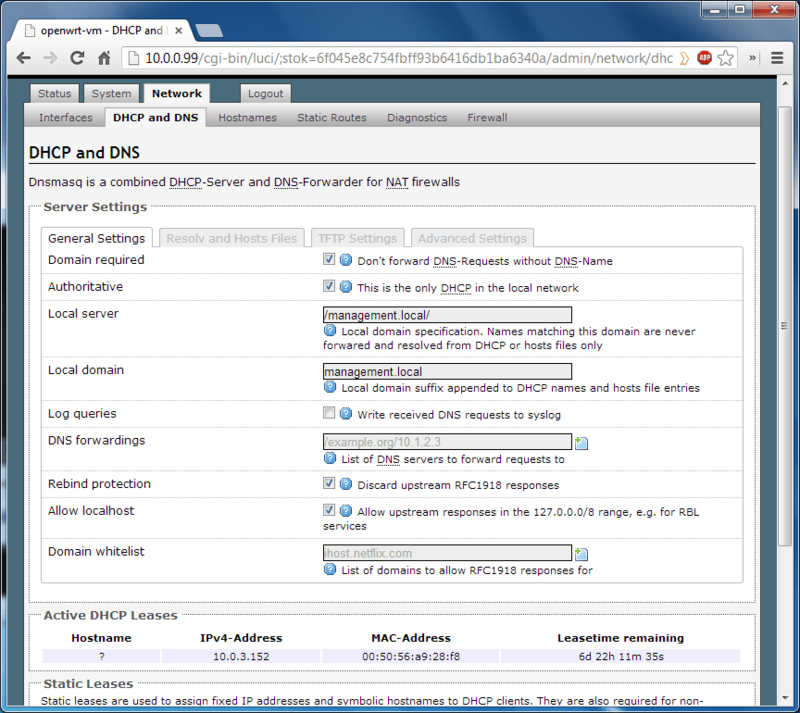 On the Network > DHCP and DNS tab there are some general settings which apply to all the interfaces. If you can tick the This is the only DHCP on the local network then do so. Making it authoritative will speed up how quickly the clients get their leases. The Local Server setting is how non-FQDN hostnames get resolved by DNS, and the Local Domain setting is the default domain setting given out to DHCP clients. The next section show the active DHCP leases. The last section is where you add your static DHCP reservations. Each interface can be associated with a DHCP pool. On the Network > Interfaces page, click the Edit button next to the VLAN that you want DHCP leases to be provided. Below the Common Configuration section, is the DHCP server section. On the General Setup tab, the first checkbox will disable DHCP if ticked. Assuming this is a subnet where you want a DHCP scope, leave this unticked. You then set the starting address (for example 100 to start at x.x.x.100 on a /24 subnet), the number of leases (for example 99 which will make the pool x.x.x.100 to x.x.x.199), and the duration of the leases. 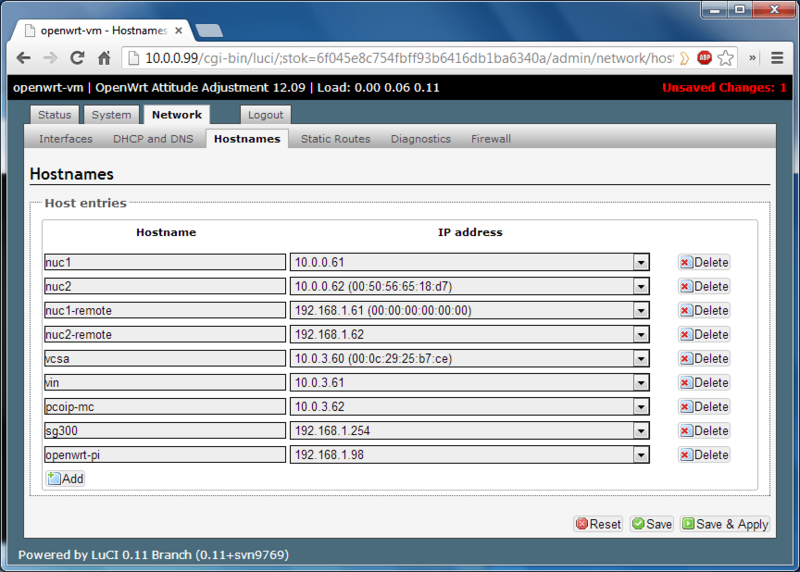 On the Advanced Settings tab you can set the subnet mask and the scope options given out with each lease. In the screenshot below I’ve set option 3 to explicitly state the default gateway, and option 6 for the DNS servers. Remember to hit Save & Apply at the bottom of the page. To set the DNS A records, select the Network > Hostnames tab and add in each record. One last thing to do before finishing up. 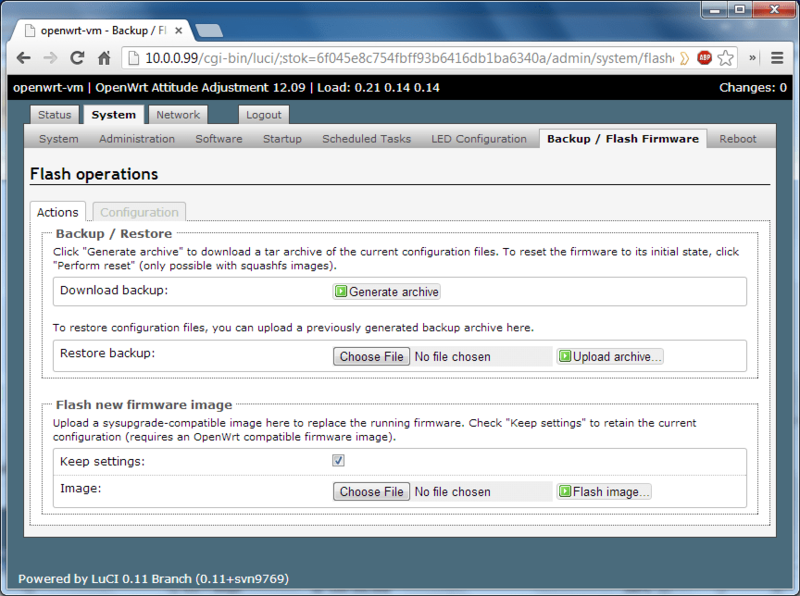 Click on the System > Backup/Flash Firmware tab. From here you can get a configuration backup exported as a compressed tarball. This is not only useful if you need to rebuild the server, but it’s an easy way to review all the important config files (it’s just a dump of those files in an archive file). When I get my SimpliVity sponsored Raspberry Pi delivered, I’ll try to follow up with another post to explain how to install OpenWRT on it.